“Can he go from the chair in the corner slowly diagonally over the floor to the left edge of the table and stretch his left, no, wait – his right paw, slowly and lift it here in the air, put it against the table and turn his head towards the camera? Like this?”, said the guy with a funny hat. He was talking about me and asking Mom and Dad. Of course I could do that. But why should I? “Ahm, no…”, Mom answered. She and Dad exchanged nervous looks. “But, Nisse*, Leroy is a family pet, not a circus cat. He cannot do tricks”, said a lady with long hair. Of course I could do tricks. But, why should I? “No, he cannot do tricks. But he can do anything if he wants to, and if he gets candy”, Mom said. Of course I could do anything, but why should I? Wait, did Mom just mention candy? Everyone was looking at me, a whole bunch of people I’ve met for the first time today. Dad got out a bag of Dreamies and showed me the candy. Everyone got excited and stared at me. Let me tell you something – if you already haven’t figured that out yourselves – I love being the center of attention. I deserve everyone’s attention. What I do not necessarily like is to do as I am told. So I jumped from Mom’s lap and ran towards the closest tunnel and crawled in. Ha, humans, eat your candy yourselves! There is a whole world of new 1000sqm I have to explore. I see you when I see you! Three hours and two shooting sessions later. Take #3. I think that we are clear on who is the King now. Give me that candy, and I’ll do the walk better than Nisse could ever dream of. Just because I want that. Heidi Klum, watch and learn, this is how you do it! Humans are an inferior species. #2 Mom’s diary, March 2013. We came back from the photo session about an hour ago. We did not take any photos ourselves, everything was sort of secret. New IKEA kitchen, six different ones, the adds will be out in June, I think they said. If they do not photoshop away Leroy, he’ll be a star!!! Leroy was really cool in an enormously big studio with many new smells. The crew did one photo session at first during which we did not get him to do what we wanted, or go where we decided. No amount of candy or petting helped. The photographer decided that we all should take a break, and let the star rest a bit. She seemed nice, and worked with animals before. Cats are the hardest to film or capture on pictures in arranged situations, they do as they want. 🙂 And Siamese and Orientals even more so than others. The second shot got much better, Leroy started exploring the main set, not only all the tunnels and the dark parts of the studio. We got to rest for 30 more minutes. Leroy was completely relaxed during he third attempt. He went everywhere we wanted, looked for candy and was as cool as he is at home. He is not a trained cat that knows tricks and so, but he is a very clever and stable cat with a lot of charisma. The crew was happy with his body language and we wrapped the shoot. It took us half a day! It is not easy becoming a star. Jocke and I were happy with “Leroy’s” new kitchen. It was elegant, a bit Japanese in style, minimalistic and the colors matched our Leroy perfectly (or the other way round). 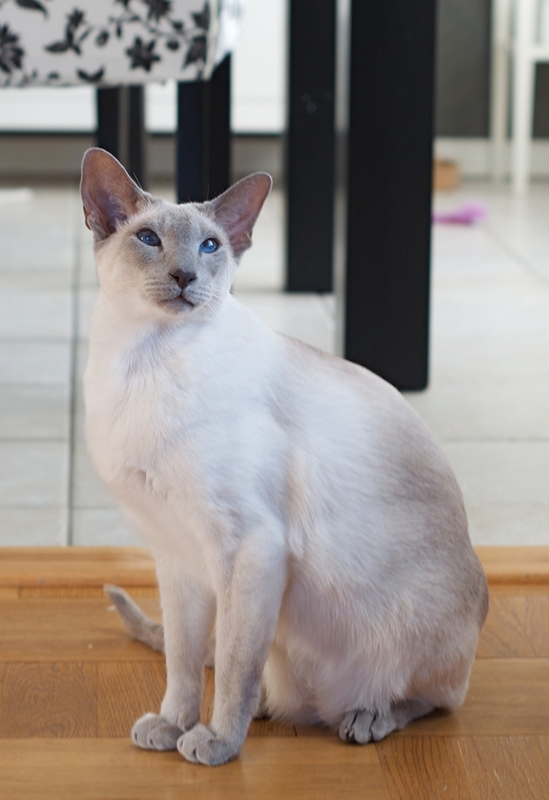 Leroy is not a tiny Siamese, but maybe that is why he was cast? Who wants a skinny cat in a kitchen commercial?! 🙂 I hope that they got some good photo today, and that they do not remove him completely from the photo. The ad’s working name is called ‘Minimalisten; walk in kitchen’. Leroy, the cutest King ever! Mom is leaving the Green Room open all the time now during the summer. Sometimes I get to follow with her outside, and run around with her and Miii and Maven. I do not want to run, but I have to, there are butterflies and grass and flowers, and bushes in the backyard. Mom and Dad are vicious people. Just when I thought that torturing me with Da Bird is the worst that could happen, they let me follow outside. I feel how the outside world is draining my energy with all it has to offer. My body is getting smaller every day. I am disappearing. I’ll melt before the autumn comes. Mom and Dad are ridiculous. They called me a star, got home a picture of me from IKEA for their personal use, they were happy. The picture of me that is online, in some commercial. I like IKEA. They make good mouse toys. I like the white ones the most. Other Siamese owners must be envious of Mom and Dad. Well, it is their fault they have strong characters and no heart and starve their cats. 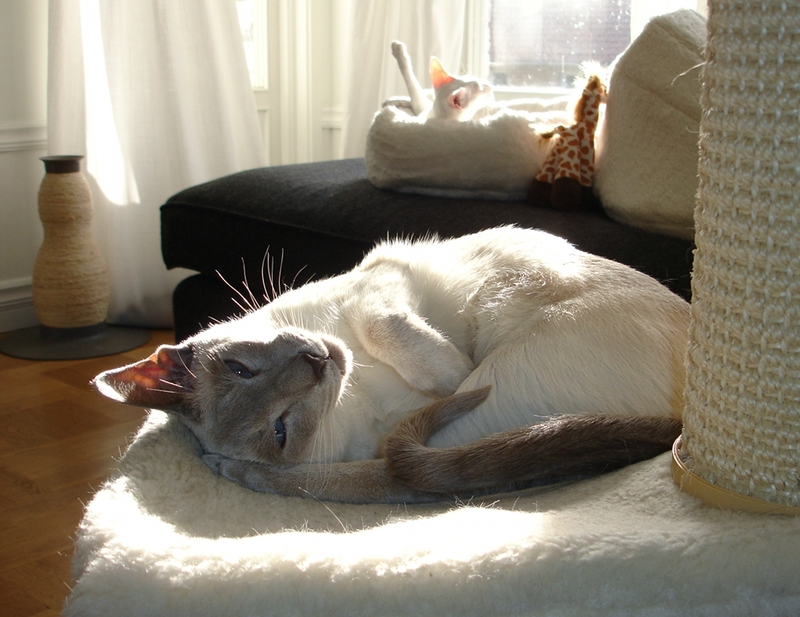 Mom and Dad are easily broken, and why would IKEA ever hire a skinny Siamese for the kitchen commercial. Hello? Of course it had to be me. IKEA took over the world and stayed on top for many decades. They know a star when they see one. The next stop – Hollywood! Again, Heidi Klum, watch and learn; here I come! P.S. I wonder if Mom got paid and what did she do with all that money. If she bought more Tasteless Mud for it, I’ll stare at her until she starts crying. Bad Mom. Where is my Tasty Crap?! My star tummy needs its Tasty Crap!!! Humans are impossible to teach and train! Arrrgh. P.P.S. Nisse* is not called Nisse, I forgot his real name. He actually weighs about 5 kg now, this summer it was 4,8kg, so it is not bad at all. The most of it is muscles. And then a little bit of extra padding.